To watch a play-through of Bally Midway’s 1986 arcade hit Rampage is to conjure thoughts of Wreck-It Ralph and his destructive path up a populated building to smash windows and grab bystanders. Instead of controlling a Fix-It Felix to subdue the trio of beasts wreaking havoc or a military entity throwing explosives to end the assault, you were the destroyers and destruction was your goal. To clear a level meant reducing every building in that city to rubble. You ate people and other food items to replenish your health bar and hoped to move from Peoria, Illinois to Plano unscathed. And you were guilt-free because the monsters were humans exposed to radioactivity and/or experimental drugs. It was okay to kill people with impunity because you were people too. If Universal Studios can mine a film franchise out of a Ouija Board, Warner Bros. can build a story around this crazy yet simple premise too. The question is how to make it palatable as something with an emotional arc alongside the unbridled chaotic fun within a post-9/11 world. Let’s face it: putting World Trade Center levels of collateral damage on Superman’s shoulders in Man of Steel under the umbrella of a utilitarian mindset wherein the ends (saving the world) justifies the means (hundreds dead) is one thing. Having him mindlessly killing all those people unprovoked and still hoping he can sustain a feature length runtime as your protagonist is another. So the four credited screenwriters changed things up to deftly toe the line between man and monster. 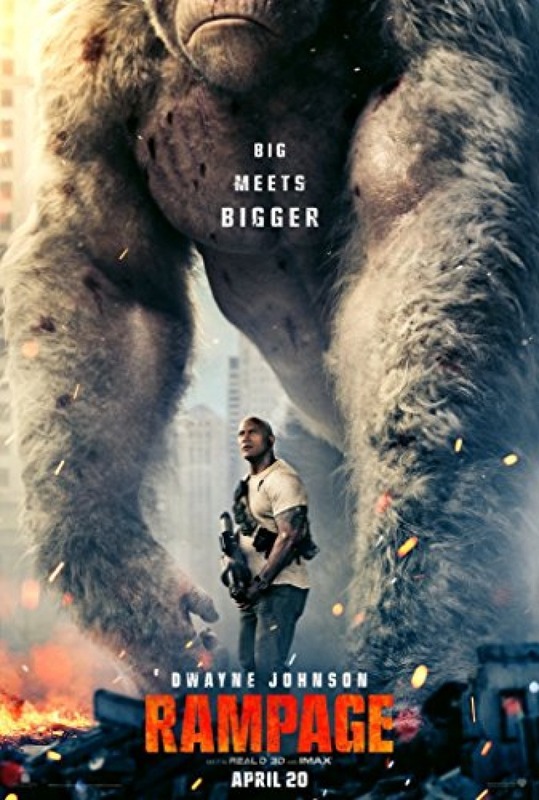 I know using the word “deft” in context with the cinematic sci-fi disaster romp that Brad Peyton‘s Rampage is seems borderline psychotic, but there’s something to say about its ability to find that balance and not simply deliver an exploitative riff on real-life tragedy. The whole is still brazenly outlandish with cartoonish villainy (the Wydens as played by Malin Akerman and Jake Lacy are ready-made foils full of steely-eyed, cutthroat opportunism and goofily dumb cowardice respectively) and half-baked notions of contemporary hot-button issues (gene-splicing as outlawed WMD with obvious financial reward potential), but there are “cooler” heads involved to hopefully prevail. The heroes aren’t nuanced (especially in gender dynamics), but they do possess enough complexity to accept that dropping a nuclear bomb ten minutes in would be rash. This means giving the monsters (George the gorilla, Ralph the wolf, and Lizzie the lizard) motivation. It means reworking their backstories from human beginnings to their respective species. So when Ralph and Lizzie begin their reigns of terror, we chalk it up to instinct. These are wild animals that don’t know anything besides the knee-jerk relationship between fear and aggression. We therefore don’t blame or champion them. We merely allow their presence to be a catalyst for the ideological and moral battle presenting mankind with the choice to become monsters themselves. Driving this idea home is a contrast in George—an intelligent beast whose origin as an orphan of poaching nurtured by primatologist Davis Okoye (Dwayne Johnson) creates empathy. Beneath his unwanted increase in formidable stature lies victimhood. Is that going to make or break your experience with the film, though? Absolutely not. It’s a nice bit of depth to help audiences invest in the characters onscreen, but no one bought their ticket to appreciate the dramatic stakes created when a flying wolf exits the side of a skyscraper to attack the woefully ill-prepared Marines tasked with shooting bullets into its regenerating, armor-like skin. It doesn’t matter how these monsters were created—only that they need to be defeated. 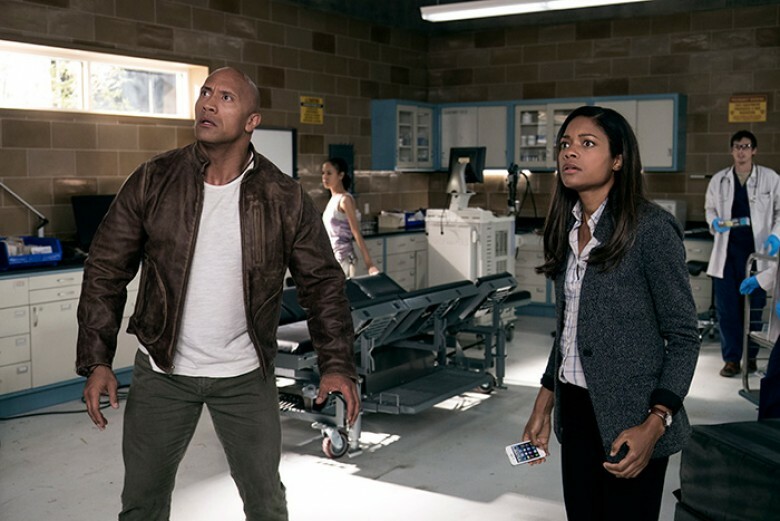 The genetic aspect is less about what they are than a reason to introduce more human characters like their proprietary owners (the Wydens) and Dr. Kate Caldwell (Naomie Harris), the latter holding science as a means to save the world rather than augment her investment portfolio. Add OGA Agent Russell (Jeffrey Dean Morgan relishing the opportunity to milk the “We want you to do Negan” studio note), Joe Manganiello‘s mercenary, Marley Shelton‘s astronaut, and Will Yun Lee‘s FBI Agent Park and you get a few more familiar faces to either maim, kill, or provide redemptive arcs depending on what the script needs to fake plausibility within its completely implausible premise. There are a ton of deaths in the wide-open space of nature and the confined quarters of aircraft, but don’t assume Peyton and company forgot the main mode of action delivered by the original arcade game. These unstoppable animals are converging on an Illinois city and they will smash windows and stomp on roofs while helicopters shoot missiles. The film embraces that built-in cheese. I wondered about this at first. The opening prologue is very buttoned-up and interested in creating suspense. Our initial greeting with Davis and George is played for laughs, but in a way that amplifies the drama of just how dangerous gorillas are. Until Lacy came onscreen to practically hyperventilate while Akerman stayed cool under pressure, I was ready to roll my eyes and scoff at yet another Hollywood blockbuster wrongly trying to legitimize something that works specifically because you can’t. Things go back to strained horror tropes for a little while longer until Morgan arrives to chew scenery like only he knows how. Finally Johnson is given some quips, deaths start being played for laughs, and the type of stupidity that earns the label “fun” was let loose. The final result is by no means “good,” but it does fulfill the promise of its source material and its trailer. I found myself laughing at it and with it in equal measure, enjoying the results of each new harrowing moment because it felt excessive rather than shameless. The film isn’t trying to force us to care about the nameless civilians being crushed underfoot. It doesn’t even try to make us care about Davis and Caldwell. We do by default because they are the “good guys,” but our main focus throughout is the wellbeing of George. This is crucial because we need that emotional resonance coming from a character that’s able to play both sides without sacrificing the other. Like any animal he is loved and feared simultaneously. Studio: New Line Cinema / Warner Bros.